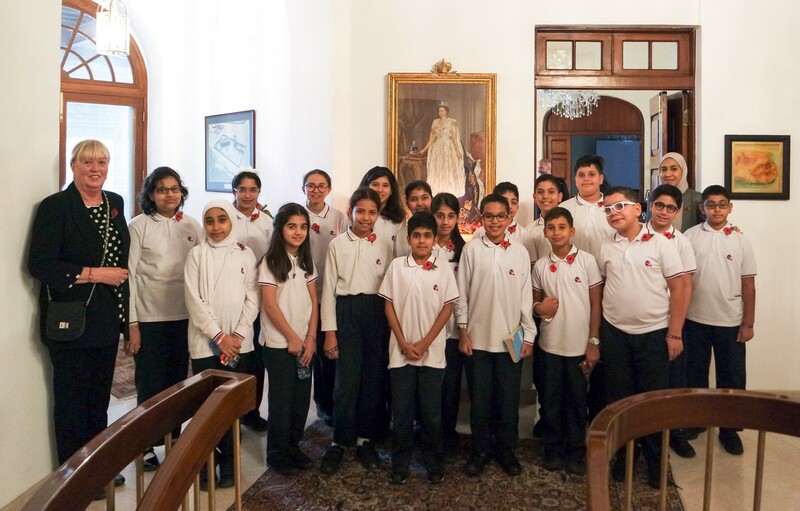 Despite the very British weather recently, it didn’t deter our Year 6 pupils from visiting the British Embassy, Kuwait, to learn more about Remembrance Day and the Poppy Appeal we’ve been running all week. Upon arrival, we were welcomed by Assistant Defence Attaché, Chief Petty Officer Richard Vesey CPOWTR (SM), then led through the lovely gardens of the embassy to the splendid public rooms of the Ambassador’s residence. 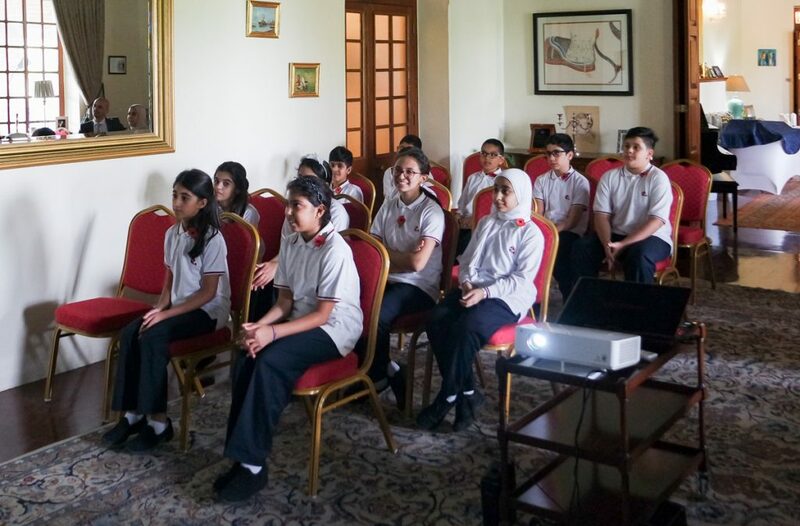 Here our pupils were given a presentation by Mr Vesey, which they quickly became engrossed in. 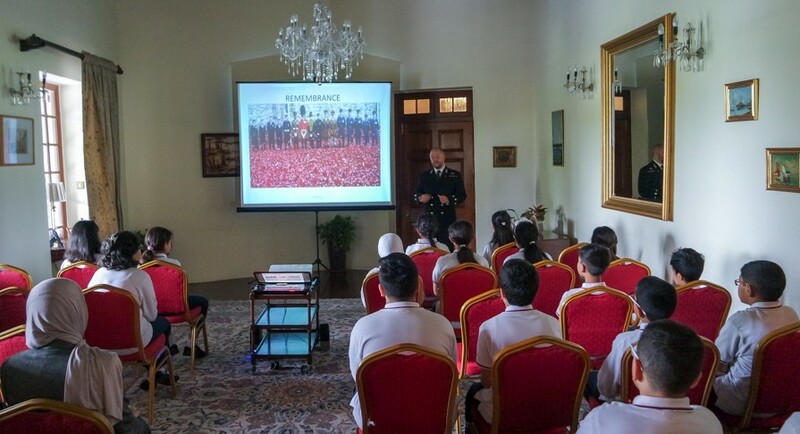 The presentation covered the World War I (WW1) history of the poppy with reference to Lieutenant Colonel John McCrae’s poem, In Flanders Fields inspired by the poppies growing in battle-scarred fields. How The Royal British Legion adopted it as a symbol for remembrance was discussed next, with it selling millions on 11 November 1921 in the first ever Poppy Appeal to help its veterans with housing and employment. 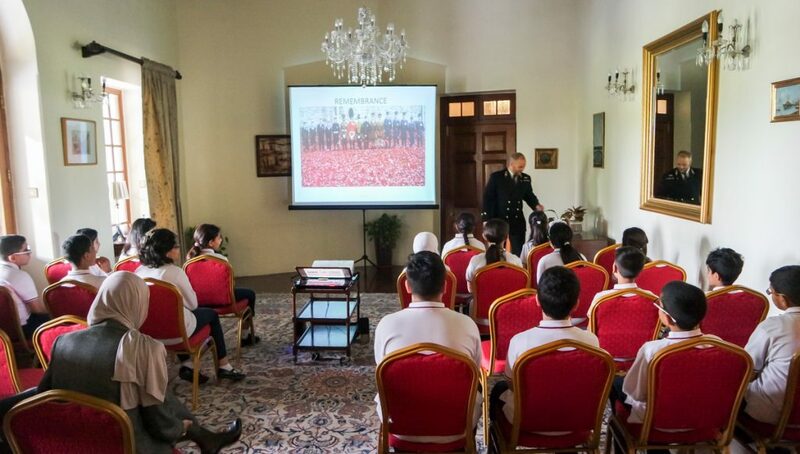 Our pupils learnt how The Royal British Legion uses the money raised by the Poppy Appeal to support: those currently serving in the British Armed Forces, veterans, and their families and dependants. 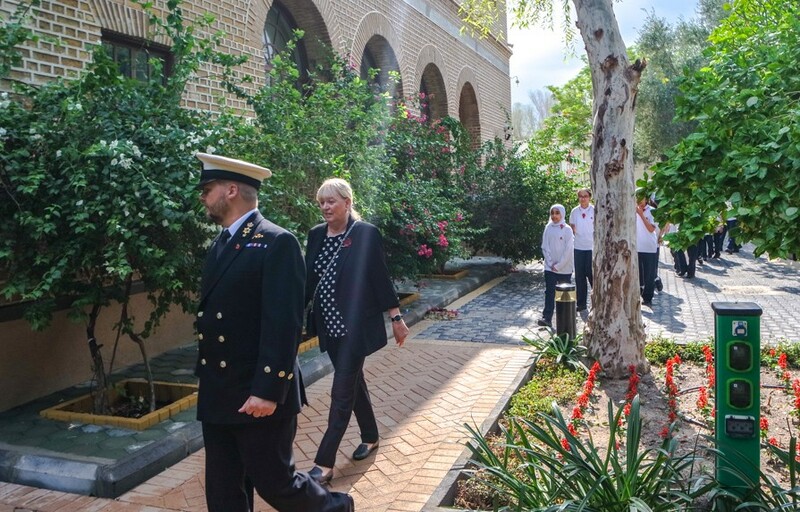 They learnt that this support includes rehabilitation for the wounded, sick and injured, as well as support for mental health issues, careers advice and care homes for veterans. 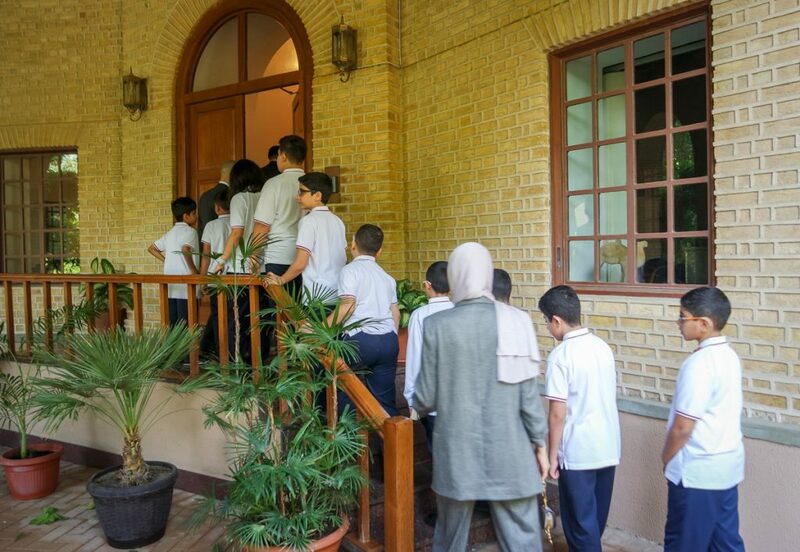 Pupils were also interested by how wide-ranging the support is, covering areas such as Finance, Independent Living, Care, Recovery, Respite, and Employment. During the presentations, our pupils answered questions and posed some very broad ones, which we’re grateful to Mr Vesey for fielding. In fact, the questions continued during the journey back to school as our pupils discussed the meaning of Remembrance Day and the poppy’s significance. 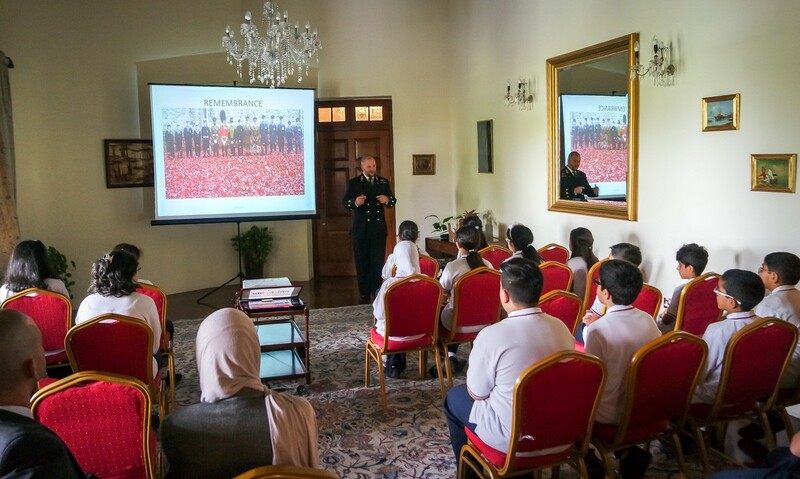 We’d like to thank the British Ambassador to Kuwait, Michael Davenport, for making available his residence for our visit and Assistant Defence Attaché, Chief Petty Officer Richard Vesey for giving generously of his time to teach our pupils and share his personal experiences. On 11th November 2018, we’ll be marking the 100th anniversary of the end of the First World War with a Remembrance Day Assembly led by our Year 6 pupils. Dress Up Day 2018 – one of our best yet!